Available from all good book shops, on-line and signed copies from this site. A few simple shapes combine to make the universal sacred model called the Gateway to the Heavens. Discover the meaning and purpose of these simple geometric shapes and how they mould your reality and your perception of it in the FIRST book in The Gateway Series. Learn how they have a direct bearing on what you are and why you are here. 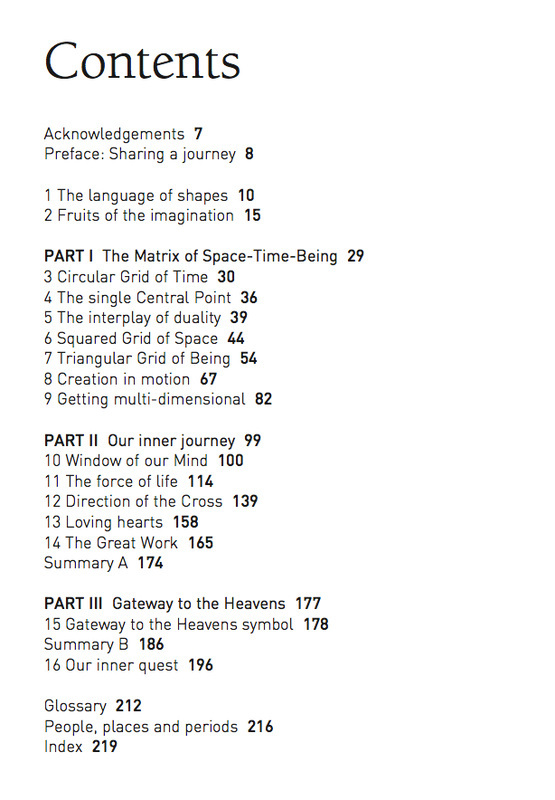 The 1st edition of Gateway to the Heavens: How simple shapes mould reality and the fabric of our being was released in 2008 in B&W. As of November 2013 it is no longer available for sale in retail outlets only on the second hand market. The famous Watkins Books shop in Charing Cross, London, did a great review in their Autumn/Winter 2008 Watkins Review. Simple geometric symbols contain messages that have been consistently represented in religion, philosophy, mythology, mysticism, the arts and sciences. Their messages are built into our genetic make-up and we recognise them instinctively. This makes geometry a universal language that allows us to unlock knowledge contained in our ‘memory’ about the true nature of reality. This universal language is evident everywhere around us, celebrated throughout nature, vibrant and unaffected by the changing values of our societies. And because of this it retainss its capacity to ‘wake up’ each new generation, if they choose to read it. Fundamental to my books is a personal voice, important part of that view is based on the English language; in particular the way that certain words describe attributes of reality, such as space and time. Even the first letters of these words bear a striking resemblance to the construction of the geometric shape to which they are related. This linking of letters, words and sounds with geometric models to describe the characteristics of the experience of reality is not new. Hindus have understood these intimate relationships for many thousands of years. Their precise sacred geometric works of art, known as mandalas or yantras, are used in conjunction with toned sounds written in ancient Sanskrit to evoke the power of the geometric image. Even modern languages can be used like the languages of older cultures to construct ‘models’ summarising universal principles. Interpreting and understanding such models relies on using your logic, creativity and intuition - sensing the material presented to you in a way that is a fundamental part of the human experience of life, of reality.